An alarming health concern put the career of Pittsburgh Penguins defenseman Kris Letang on hold, but his promising recovery has him back on the ice and ready to contribute. The 26-year-old suffered a stroke on Jan. 29 and has been recovering over the past 10 weeks. Letang has practiced with contact for the past few weeks after being cleared by doctors and the team announced he will return Wednesday against the Detroit Red Wings (8 p.m. ET, NBCSN, TSN2). From a fantasy standpoint, any owner who held onto Letang during his recovery period is now likely to see him pay dividends down the stretch. If your one-year, head-to-head league does not permit owners from making waiver-wire transactions once eliminated, there's even a chance Letang is available at this time for your championship round (owned in 75 percent of Yahoo leagues). In terms of keeper-league value, there's no question he deserves to be retained in all formats. NHL.com fantasy correspondent Brian Metzer argues Letang is in line for a bounce-back season in 2014-15 if he can stay healthy. Letang was ranked the No. 3 fantasy defenseman by NHL.com's Fantasy Hockey staff entering the 2013-14 season, but has been limited to 34 games this season due to a lower-body injury earlier in the season and the stroke. Even so, he is one of 25 defensemen League-wide with 10-plus goals this season. The other 24 defensemen on that list have all played at least 51 games. 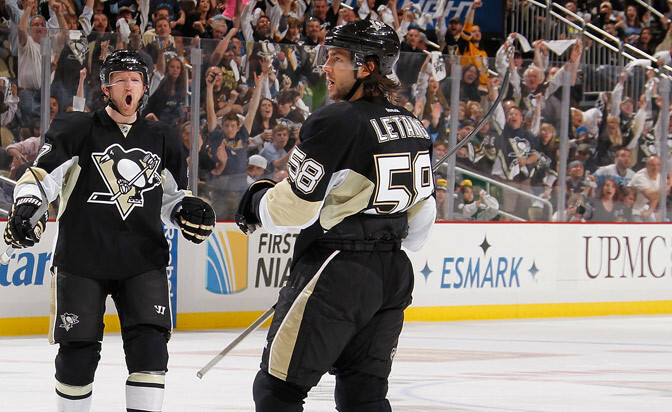 Over the past three seasons, Letang has played 120 of a possible 209 games. But among the 18 players who have combined for 25-plus goals during that stretch, Letang has the fourth-best goals-per-game average (.208), trailing only Erik Karlsson (.254), Shea Weber (.242) and Dustin Byfuglien (.213). His power-play repertoire is also impressive as over one-third of his points (39 of 98) over that same stretch have come with the man advantage. This season, Letang (10 goals on 100 shots on goal) is one of five defensemen with a shooting percentage of 10.0 or better (minimum 75 shots), along with Tyson Barrie (12.5), Weber (11.2), Justin Schultz (10.5) and Zdeno Chara (10.1). You get the drift. When healthy, there's no disputing Letang's offensive capability is as good as it gets -- outside of Karlsson -- at his position. The Penguins have three regular-season home games remaining, where the team has 27 wins (tied for fourth in the NHL) in 38 games this season. Even though Letang is likely to see less ice time than the 24:13 per game he was accustomed to prior to the stroke, that's not to say he won't be able to boost the injury-depleted Penguins' offense and chip in some points for your fantasy squad.